This couldn't just be another 'Gaga for Romwe...' right? Lady with Sunglasses Squared is just too fun of a blog title post! As I mentioned in this post about Romwe, I stumbled upon the site this spring and loved that they had relatively cheap midi novelty print skirts. This is the other one that I fell in love with AND that by using the site's zoom function I deemed to have acceptable quality. I just love how chic, first lady like, classic, ethnic, feminine, art deco, etc ETC this print is. It's like every possible cool retro theme into one skirt and one repeated print...but it's all so seamless! Obviously I had to wear similar sunglasses for this photoset to match the woman on my skirt!! Because it was such a classic look in many ways, I'm super glad I accidentally found this fence post along the side of the road to pose at. Initially I was going to a gazebo in the park, but upon pulling up there I saw a couple hanging out on the park bench right by it and opted to go elsewhere. This was a happy accident! Because this look is somewhat classic, I decided to slightly rogue by putting a color-wise matching but pattern mixing hair bow on the side. I'm growing out my bangs for the summer, so this was both a choice of convenience/necessity as it was a choice to funk out the outfit a little. The details of how much I rave about Romwe can be found here. That said, this zipper is a little difficult, but my other skirt (found in the linked post) is not. This skirt as a mini skirt. 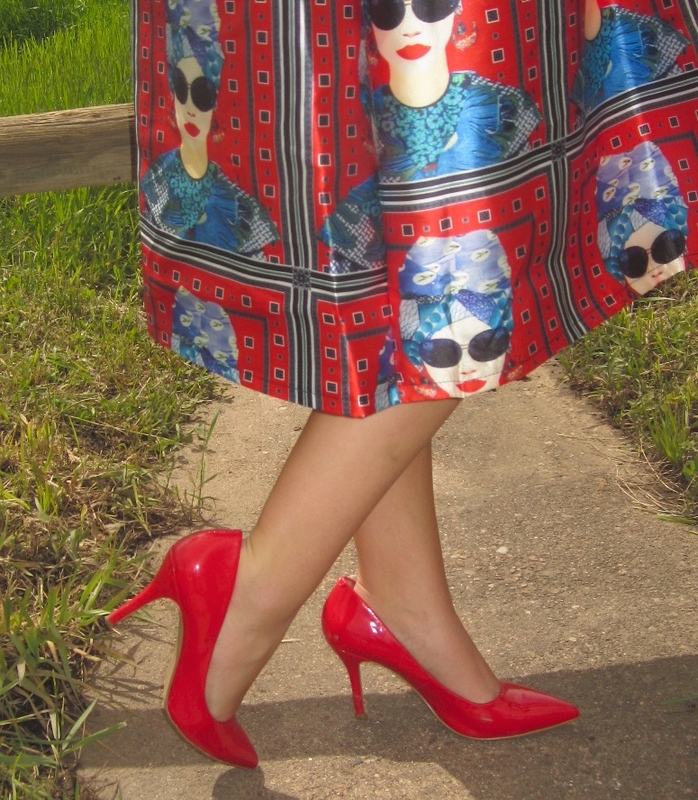 Love this bright red skirt print! Your hair always looks so perfect. I'm also in love with your shoes! What a fun skirt! So cute and vibrant. Thank you for stopping by at my blog! :) Love this outfit! Especially the skirt! Perfect! Such an amazing skirt! You look gorgeous Lauren! That skirt is beyond gorgeous!!! Thank you!!! I'm on all but GFC, but yes to the other 3! Hahaha I hope it does because it's a fun outfit! Thanks, love! Oh your skirt is so amazing. This look is so fun! That skirt is amazing! This skirt is fantastic, I loved it - you won't mind if I get a similar one, I hope! I liked the colors, the print and you pictures - so beautiful! Great find! That skirt it so original! Love the look! If I had a skirt like that, I'd be obsessed too! It's gorgeous and so original, I love it! You look fantastic! Special love skirt! The skirt is insanely beautiful! Great style! Lauren this is a gorgeous look and a perfect backdrop. Love every single detail of your OOTD. The red shiny heels, awesome, the skirt and its print is just stunning. The top's so beautiful. You look drop dead gorgeous, girl. You always look so amazing and I adore your retro style! This skirt is perfection and I'm loving how you match it! Even your hair remind me of the lady in the skirt. So well done. Thank you!! I almost put it in a scarf but I opted for the bun instead, so I appreciate you saying that! I love this full skirt, such a fun print and your red lips and hair make this so pinup like. You look fabulous! Qué maravilla de falda!!! Estás guapísima!!! What a fun skirt. I love how you mimicked your sunglasses with hers. Your red pumps are so fun! Hello, my gorgeous friend! You look so lovely – I’m totally smitten by your look today! I'm following you in bloglovin, please could you follow me back? Thank you! I think I followed you back...I'll double check! That is a lovely and unique print! You've worn it well with the black top and matching sunglasses! Loving the retro vibe of this outfit, so cute! The skirt is such a statement piece! you look so pretty! I love the skirt! OMG I love those purple converses! Great photography! Amazed at how you got those bright colors to all fit together to make such a bold statement outfit idea! That skirt is amazing! It looks so good on you!